May 4, 2017 0 comments on "Canning Maraschino Cherries"
This is an easy recipe for canning maraschino cherries. To prepare this recipe, you will need cherry flavored liquor. If you can find it, maraschino liquor is the best choice, but cherry flavored brandy will also work great. Use the best kind you can afford, and you will taste the difference in the finished product. This recipe makes approximately 2 half pints. You can easily double or triple this recipe. To prepare the cherries for this recipe you might want to find a cherry pitter. You can buy cherry pitters like the Norpro Deluxe Cherry Pitter very inexpensively both online and in stores. They are indispensable when preparing cherries for recipes. The cheapest ones remove the pit from one cherry at a time, but you can also buy some that pit more than one cherry at one time. It just depends on how many cherries you need for a recipe. After you have washed the cherries and removed all the pits, set them aside. Combine the sugar, water, lemon juice, cinnamon, vanilla extract, and almond extract in a medium sauce pan. Bring the mixture to a full boil. Stir in the cherries and cook for about 5 minutes. Remove the pan from the stove and stir in the maraschino liquor. Let mixture cool. Pour the cooled cherry mixture into clean canning jars. These cherries can be stored in the refrigerator for 2 to 3 weeks. If you would like to can them to extend their shelf life, then pour the mixture into clean and sterilized pint or half pint jars, leaving 1/2 inch head space. Wipe the rim of each jar with a clean damp rag and place sterilized lids and rings on jars. Place the jars in a boiling water canner and cover with water so that the water is 1 inch above the jars. Process the jars in boiling water for 10 minutes. Remove the jars from the canner and place on a towel on the kitchen counter to cool. After jars have cooled, make sure jars have sealed by pressing down on the center of each lid. These jars can be stored in the pantry for 1 to 2 years. Cherry season in North America is in June, so watch for specials at your local orchards or grocery stores. These maraschino cherries would be a great hostess or holiday gift. 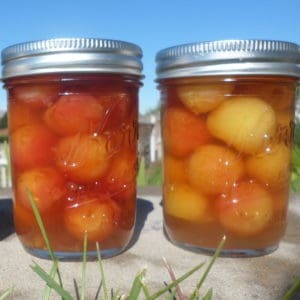 Who wouldn’t like to receive a jar of homemade maraschino cherries as a gift? The next time you buy cherries, enjoy eating a few handfuls of them and then give this fun recipe a try.